The Earth Summit serves as a place for students, staff, and our local community to collectively envision a sustainable future, and discuss ideas for action. The theme of this year's Summit showcases the role music and art plays in enacting environmental change. The Climate Music Project will give its unique performance of original music guided by climate data. There will also be student speakers, who will discuss current events related to the environment at UCSC. 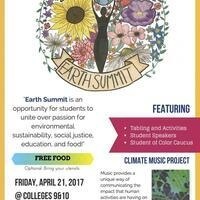 The Student of Color Caucus, hosted by the POC Sustainability Collective, will convene during Earth Summit for its third year. The Caucus is a space for Students of Color to share experiences and brainstorm visions and actions they would like to see on the campus.